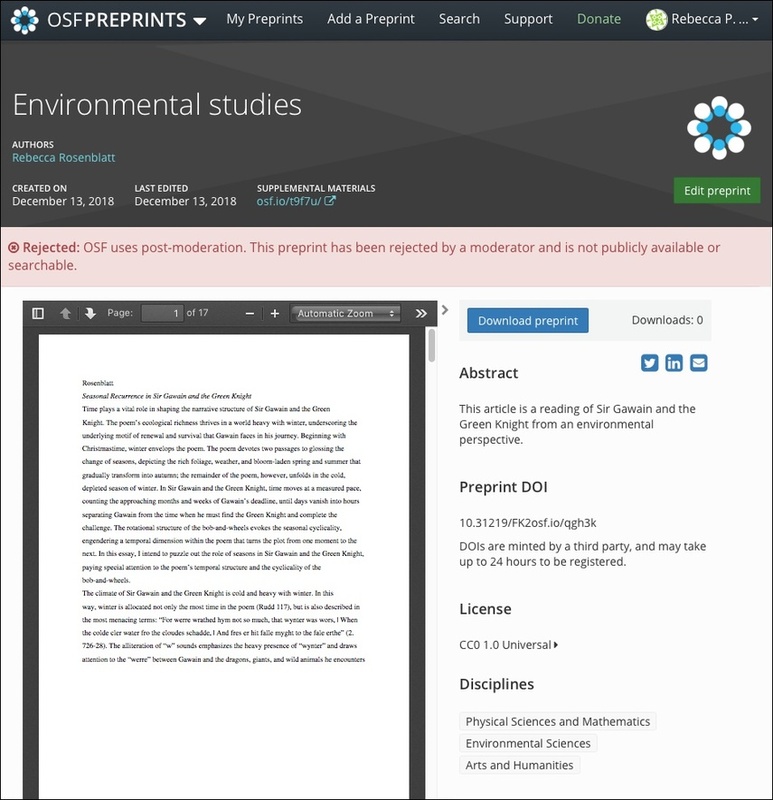 Some preprint services moderate the content submitted to them. There are two types of moderation: pre-moderation and post-moderation. 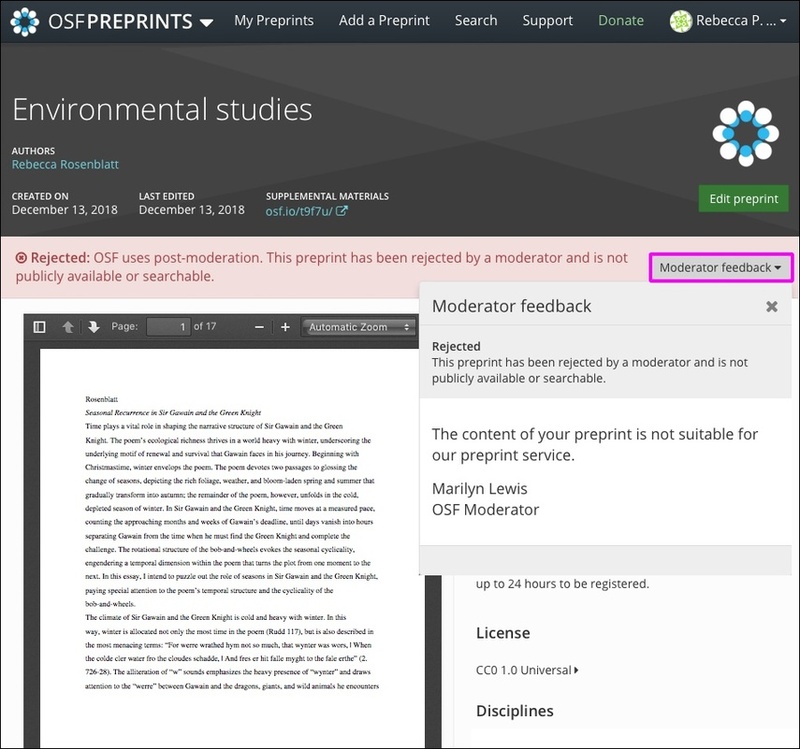 Moderators using pre-moderation will accept or reject preprints upon submission, while moderators using post-moderation will accept or reject preprints after they have already been submitted and made public. Check a preprint service's submission guidelines (if available) in the footer to determine if your content is suitable for their service. Submissions to a pre-moderated preprint service will be in a private, pending state until a moderator accepts or rejects them. Moderator may provide feedback. Moderators may be anonymous or may choose to share their identities. 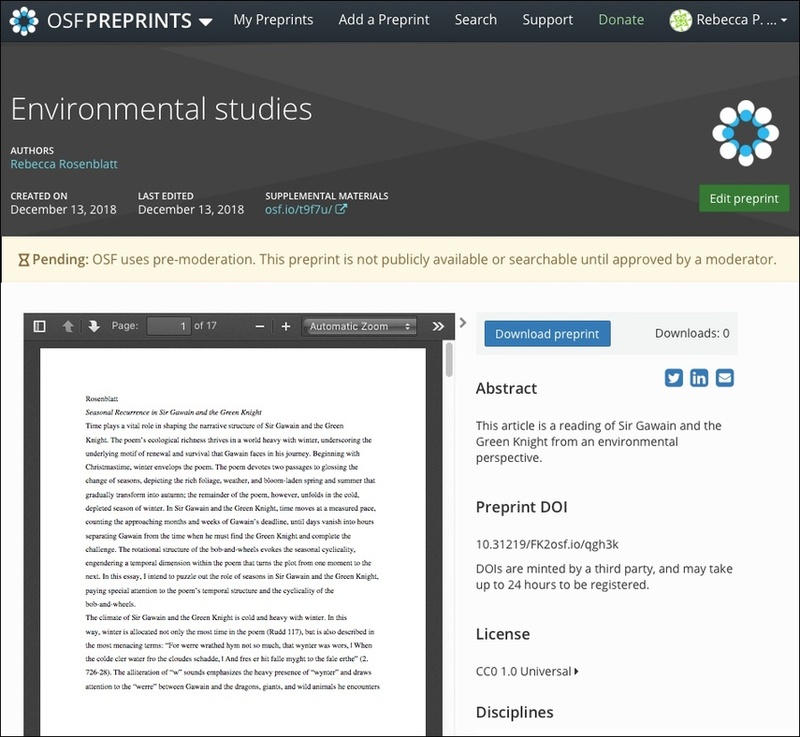 After you submit your preprint, a yellow banner will appear at the top of your preprint page with a "pending" status. Your preprint will remain pending until a moderator has accepted or rejected your preprint. 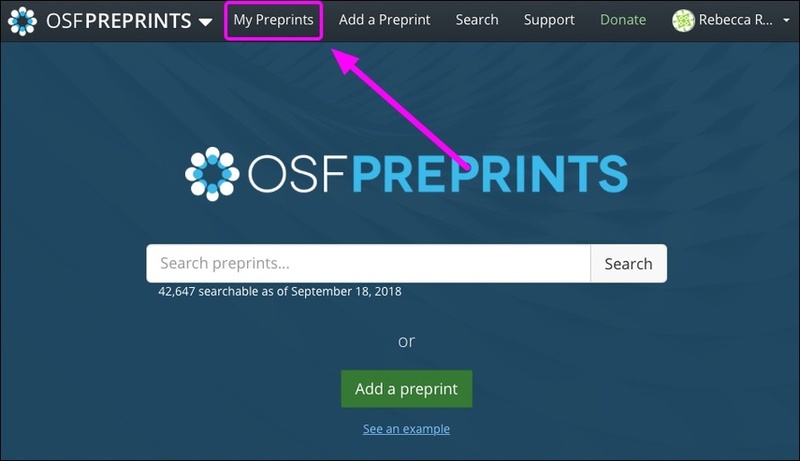 To find your preprint when it's pending and private, sign in to OSF Preprints or a community preprint service. 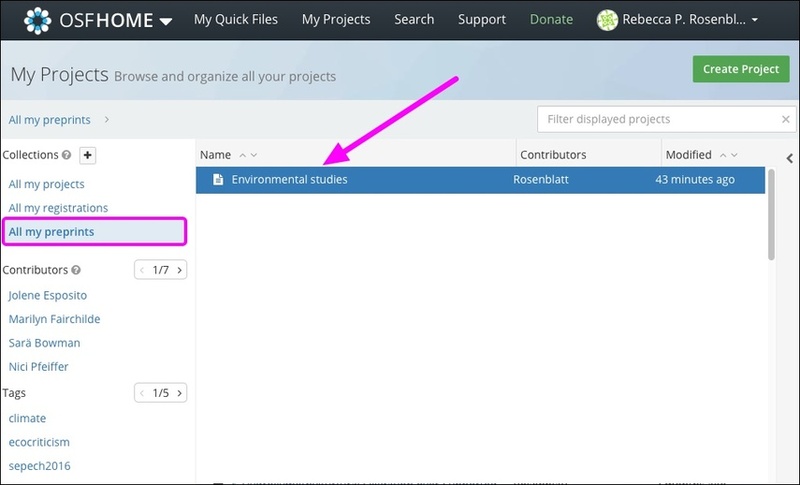 Then click the My Preprints tab in the navigation bar. A list of your preprints will appear. Select your pending preprint from the list. You will be taken to your preprint page. If your preprint is accepted, you will receive an email notifying you of the decision. 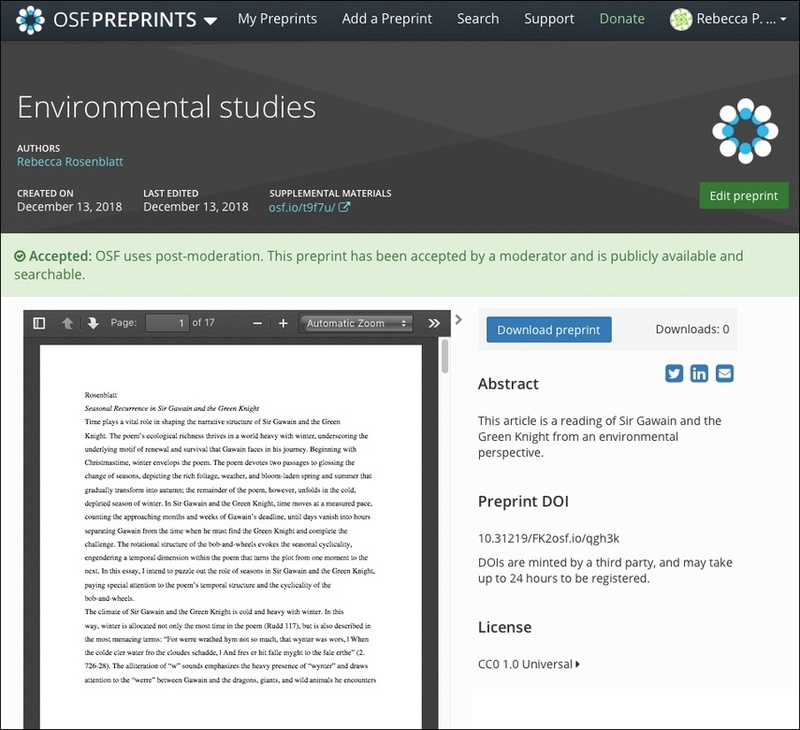 There will be a green banner at the top of your preprint page with an "Accepted" status that is visible only to the authors. If the moderator has provided feedback, you will see a "Moderator feedback" button on the right side of the banner. Click this button, and the moderator's feedback will appear. Moderators may choose to be anonymous, in which case their name will not be listed. Your preprint will be made public upon acceptance. If your preprint is rejected, you will receive an email notifying you of the decision. There will be a red banner at the top of your preprint page with a "Rejected" status. Your preprint will be removed from the preprint service upon rejection. 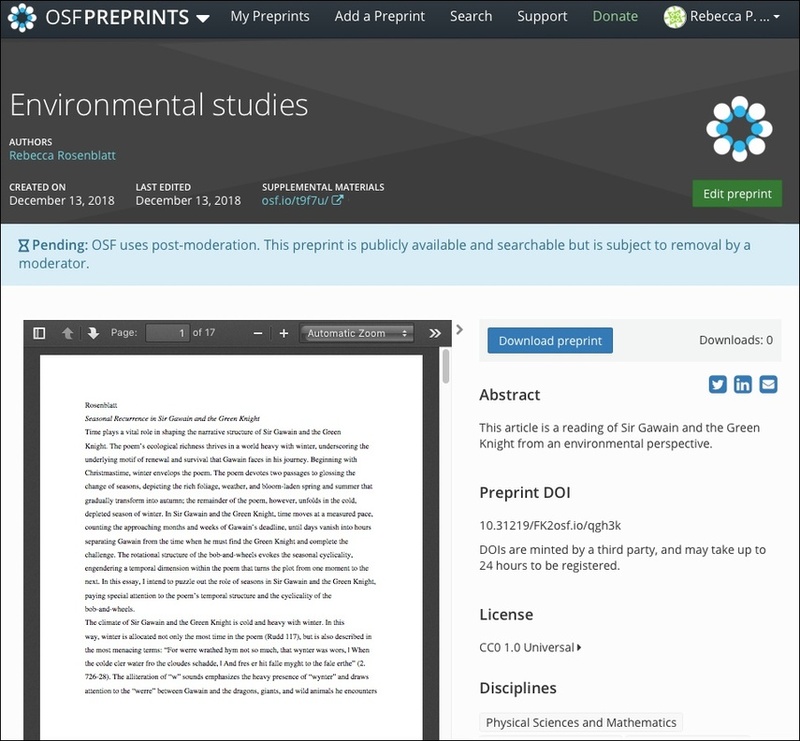 Submissions to a Post-moderated preprint service will be public upon submission, after which a moderator will accept or reject your preprint. Until a decision is made, there will be a pending status at the top of your preprint that is visible only to the authors. 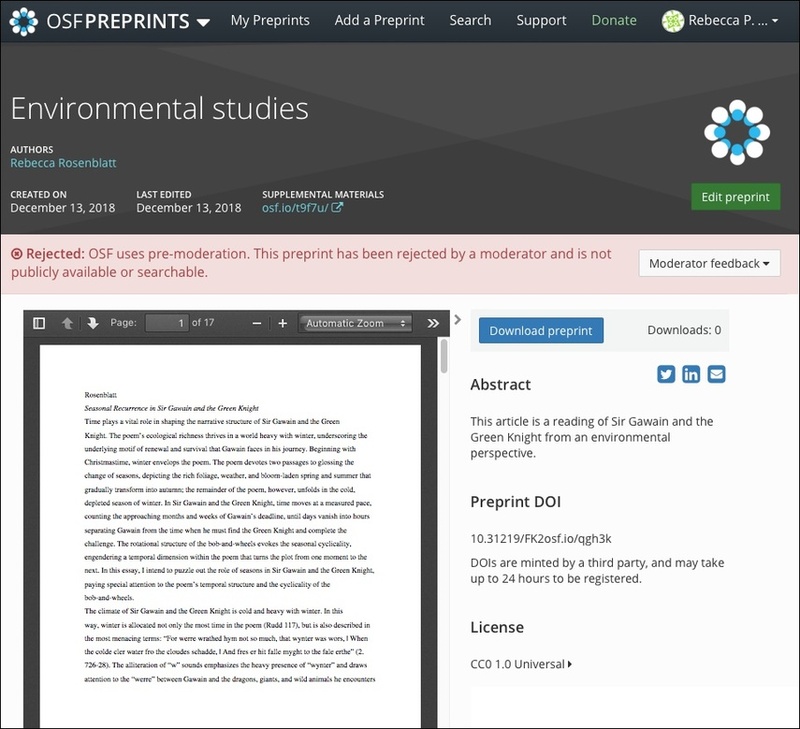 Although your preprint will be made public upon submission, it can be subject to removal upon moderation. A moderator may provide feedback. Moderators may be anonymous or may choose to share their identities. 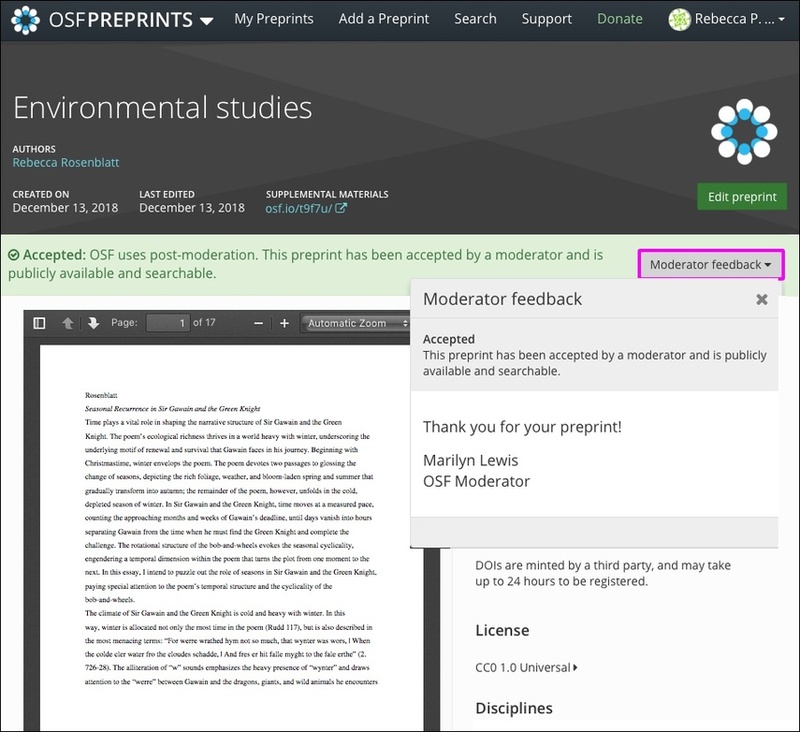 If you submit your preprint to a preprint service that uses post-moderation, a blue banner will appear at the top of your preprint page with a "pending" status. 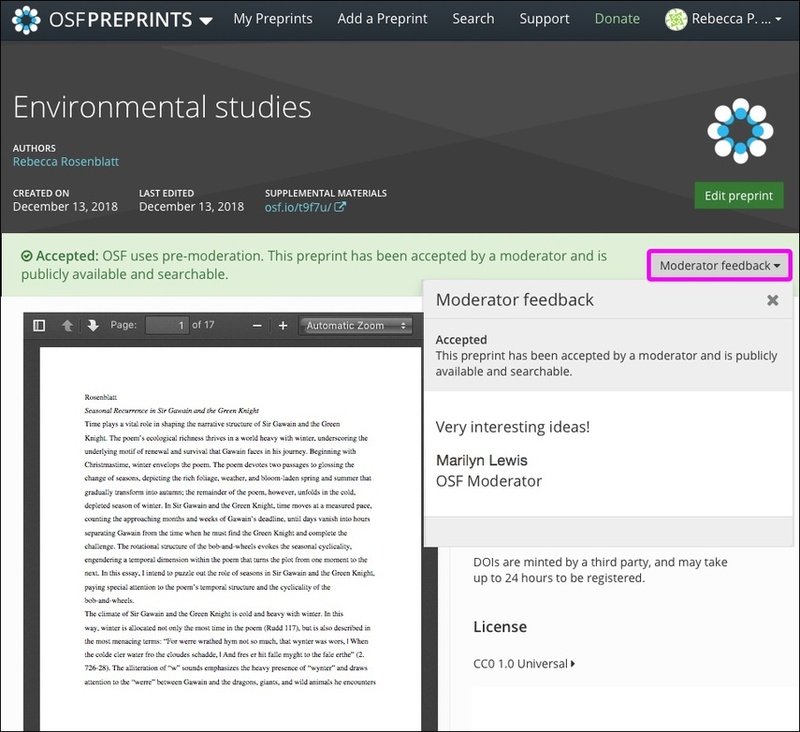 Moderators will review your preprint and will either accept or reject it. 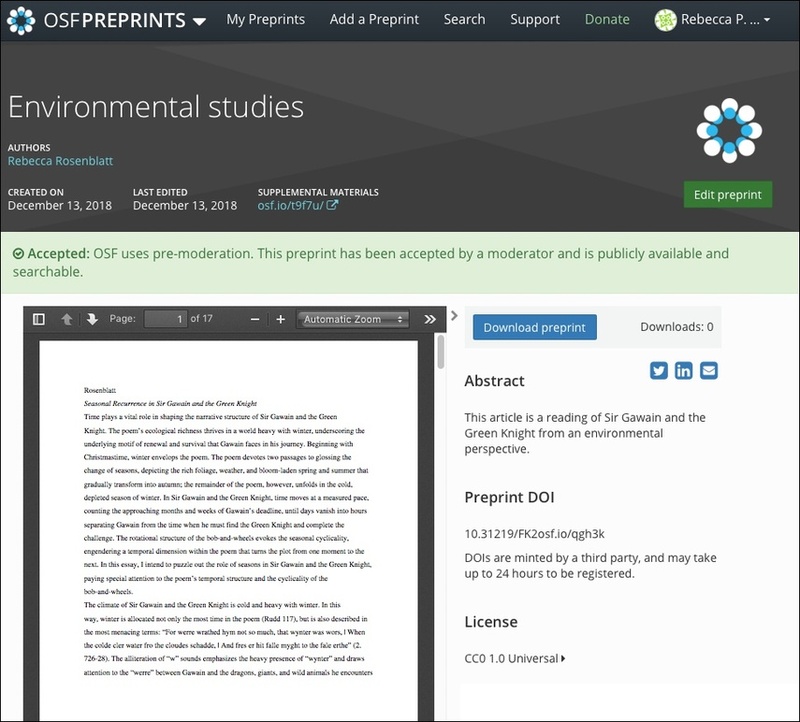 There will be a green banner at the top of your preprint page with an "Accepted" status. Your preprint will remain public upon acceptance. Your preprint will be removed from the service upon rejection.